PRODUCT DESCRIPTION: Slow releasing granule which will take a few weeks to work it's way into soil where it will remain active for 6-12 months. It does not kill quickly like the Cyfluthrin but will provide longer control which is helpful for long term pest management. This formulation has a .5% active ingredient. WHERE TO USE IT: Turf, gardens, flower beds, etc. RATE OF APPLICATION: One 10 lb bag will treat 7,000 sq/ft. Apply at least once a year. How does this product affect pets, dogs especially? These granules are one of the safest option for use in the yard where people and pets are active so if your concern is about your dog's safety, there is no reason to be concerned. If anything, there could be a slight benefit. Why? Well, it just so happens the active in these granules are also used on pets for fleas and ticks! As crazy as it might sound, it's the truth. So if you review the label of this product, you'd see it uses a .5% Imidacloprid. This active is available in many forms including a form we sell for use on garden vegetables intended for people to eat. But this same active is also one of the biggest selling flea and tick treatments manufactured by a company called Bayer. Have you ever heard of Advantage for dogs? I think right now its being called "Advantage II". Well guess what? That product uses a 9.0% imidacloprid which is almost 20 times stronger than the granules above! And do you know how Advantage is used? By putting it on directly on your pet! In summary, the active above is about 20 times weaker compared to a product vets are recommending for use on pets for fleas and ticks. And I happen to know Advantage is quite safe for use on pets and that it also works well. So if your dog (or other pets) were to walk through the yard and pick up some of the granules you apply, you can rest assured the granules won't hurt them. In fact, I'm not sure the granules are strong enough to affect fleas; that's how weak these granules are. 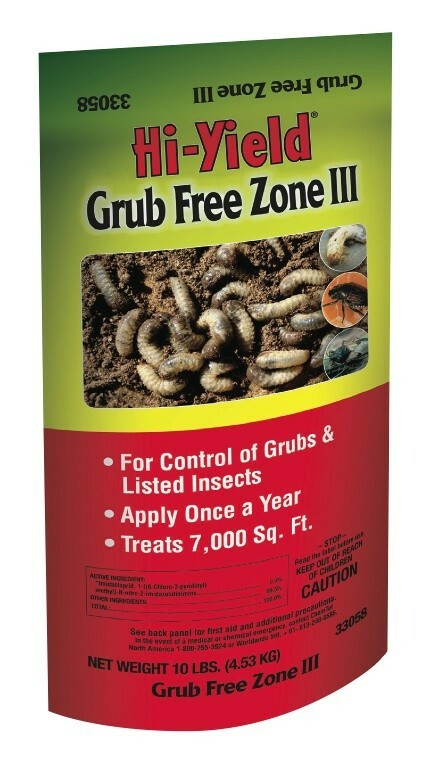 But fortunately grubs are easy to kill which is why you can use such a weak formulation on them and still get control.